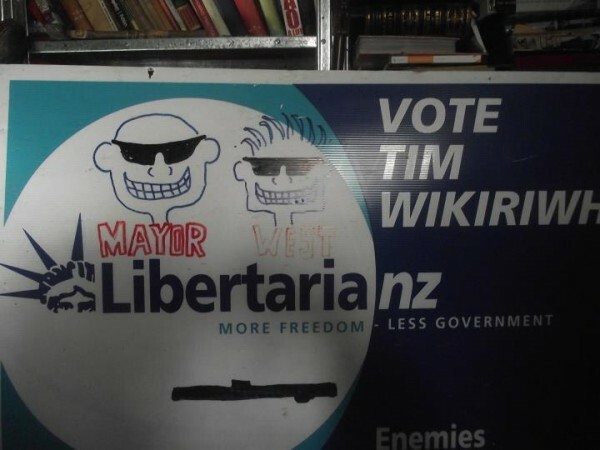 Tim Wikiriwhi, outspoken Christian Libertarian and prominent member of the New Zealand Libertarianz party of New Zealand, is running for mayor of the City of Hamilton, the fourth largest city in New Zealand. Mr. Wikiriwhi is a Neo-Jeffersonian, and has been a bona fide freedom fighter for decades. I’ve interacted with the man personally, and I can say that speaking with this bike riding, metal jamming, straight-shooting kiwi leaves you feeling that the fight for liberty is a zombie apocalypse in which he’s packing a pump 12 gauge of truth against a zombified liberal horde. The man is leader, not a joiner. 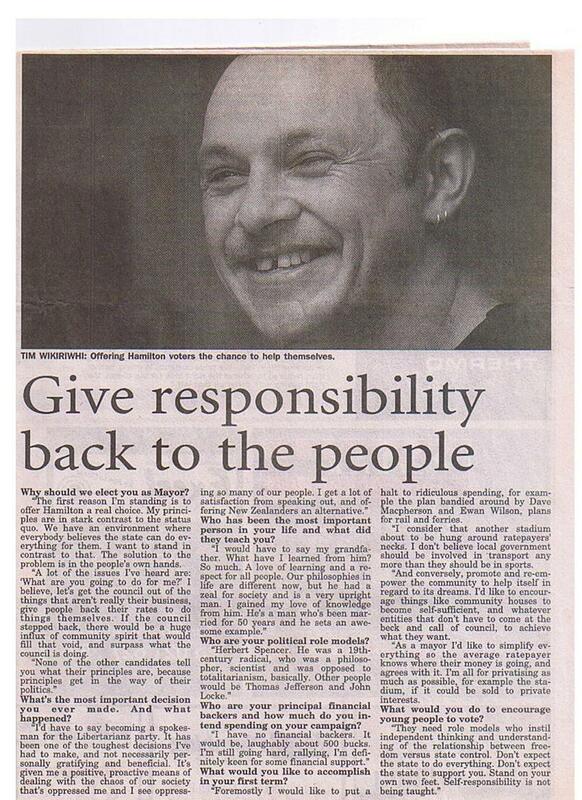 Even with people he respects, he’s doesn’t shrink from dishing out some tough love when it’s called for, much to the chagrin of many of the more intellectually intransigently impecunious among the New Zealand freedom movement (e.g. the SOLO crowd). This author is very interested to see how this race turns out, and will follow it closely. Best of luck Mr. Wikiriwhi. I hope you are able to bring liberty to bear upon your corner of the world. A pro-freedom victory anywhere in the world is a victory for liberty everywhere in the world. If you’re the praying type, this would be a good thing to support with your supplications. I know I will. Music review by PJ Cornell. Bottom line up front: This guy just needs to put out more songs. But what he lacks in quantity, he makes up for in quality. When he sings, it feels like he’s talking to you. When he talks, it feels like he’s singing. An incredible voice. Highlights: Lullaby. I think this is a cover; I’m certain I’ve heard this song before — but not performed this well. Again, the best feature of this song is this guy’s incredible baritone. What he has achieved with this recording is what meditation tapes try and fail to achieve — total relaxation in the deepest recesses of the soul. Simply excellent. Conclusion: This guy’s manager should hook him up with a song writer and start putting out more recordings immediately. Bottom line: China is a huge threat to America’s sovereignty at the moment, however, over the long term, they are not — all we have to do is keep our government intact and legitimate (insofar as possible), and wait them out. Here’s the thing: they own a lot of our debt. Tom Murse of About.com reports that China owns 1.2 trillion dollars of US debt — more than any other individual stakeholder — and they use this debt, as well as its connections to corporate America, which, of course, feeds back into the American political machine, to influence our politics. The Chinese government is openly coordinating with US Businesses. This is a major problem, because it allows them to have a say in American politics; case in point, gun control. Why would China be calling for gun control in the US?! This is something that must be addressed on the federal level, on the state level, on the local level, and on the individual level. Right now, it seems Americans, fortunately, are standing their ground by purchasing guns and ammo at record rates, which is encouraging. But it is unsettling that China has so much obvious influence over American politics. This influence is exacerbated by the fact that so much American industry has moved to China. However, the tides are already shifting on this front, as Vivek Wadha of Forbes reports. This brings me to my next point, which is: why China is not a threat over the long-term. Part of the reason for this is its currency manipulation coming home to roost, however, the root of China’s inevitable decline in influence and economic power is its one child policy. China’s economy is on decline, and the reason for this is that what once drove their economy — cheap labor — is going away as their population declines. Their one child policy will halve their population, and they have not yet relinquished it, which means it will halve twice. Furthermore, because of Chinese cultural preferences for male children, their population will halve again even after they’ve gotten rid of the onerous policy. The Chinese already have ghost cities created through economic over-extension, and their troubles are going to get worse, not better. Soon, they will have one quarter of the population supporting the other three quarters. At that point, their economy will completely collapse, and they will not be in a position too mount any kind of existential threat to anyone. In the short term, we must closely watch Chinese influence. In the long-term, however, China is not something we need to worry about.